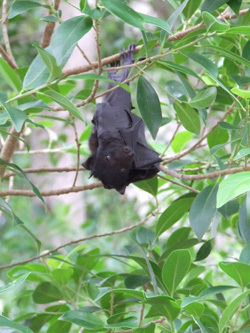 This flying fox pup was found by WIRES member Melanie while she was checking the colony during a period of very hot weather. 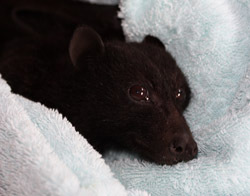 He is a Black Flying Fox, only about three weeks old and should have still been with his mother. He was badly dehydrated and would not have survived much longer on his own. 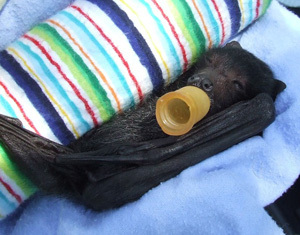 He was given emergency care and then passed on to WIRES Flying Fox carer Clare. 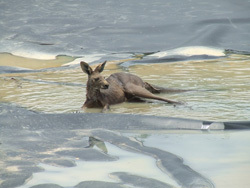 This Eastern Grey kangaroo (sub adult male) was trapped in the Metgasco settling pond at Pollock Rd, few km west of Casino. Pumping into it has not yet started, so it contained only shallow rain water. As you can see, the sides are black plastic so there is no way of any animal getting out. The other pond nearby apparently has had dead birds and lizards in it, according the the local anti gas action group who has been monitoring the ponds. (they called WIRES about the kangaroo). 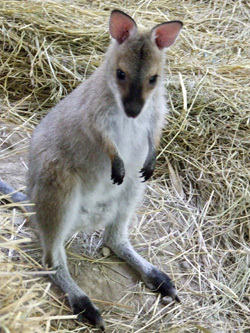 The kangaroo was suffering from myopathy due to being trapped for extended time and despite being given medication on site by WIRES he did not recover and was humanely euthanased at the vet. WIRES has suggested ramps or shade cloth for footholds to give the animals ( or a child ) an avenue of escape. Dusk and dawn are high-risk times for many nocturnal animals. These times are especially busy for kangaroos, wallabies and possums who may be feeding on roadsides or returning home to their mates and families. If you must drive during these times, please take extra care. Drive a bit slower as this will give you the chance to slow down enough to avoid a collision with an animal or bird. If a collision is unavoidable and it is safe to do so, please stop and check the animal to see if it is injured and needs help. 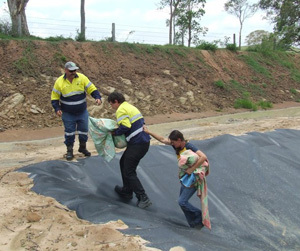 If the animal you have hit is dead, if possible remove the body from the road. Some animals and birds feed on road kill, such as the magnificent Wedge-Tailed Eagle. By eating on the road, they may also end up as fatalities. If the animal you have hit has a pouch, you can check for young joey's. 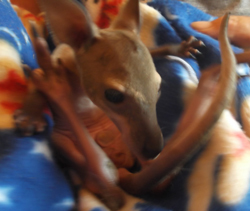 Joey's may live in the pouch of their dead mother up to four days. Don't attempt to remove the joey's: call WIRES right away and advise them of the situation. 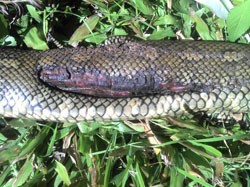 Recently a large Blue-Tongue lizard was run over in South Casino. She was heavily pregnant and about to give birth. Unfortunately, whoever ran her over did not stop and over the next few hours other cars also ran over her. 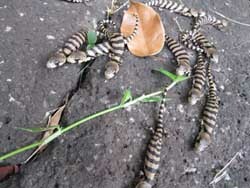 By the time a concerned resident noticed a live baby lizard by the side of the road, mother lizard and 9 babies had perished. 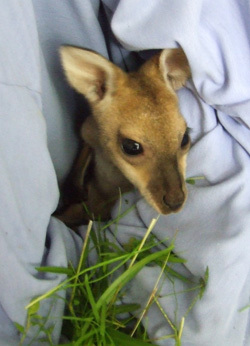 In another incident, a young joey was rescued when his mum was hit by a car. The driver stopped to check on the mum and discovered the young one still alive in the pouch. 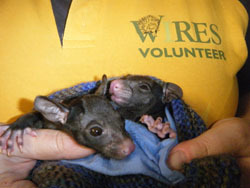 WIRES was able to take two young lizards and the joey into care. An all-volunteer organisation, WIRES needs new members throughout the Northern Rivers. We also welcome calls seeking information or reporting your sightings or experiences. Call our 24 hour hotline on 6628 1898 or have a look here to discover the many ways you can help. Take care and peace to all creatures great and small. This juvenile currawong suffered a collision, most likely with a car, that causes an internal leak in her/his air sacs that swelled his head and neck like a balloon. Air sacs are part of a birds' respiratory system and enable them to process more oxygen with each breath. 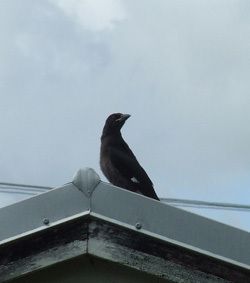 After initial antibiotics and time in a hospital enclosure, he is now in an aviary with two other young currawong's. Only one week later, the swelling is almost all gone and he is self feeding and flying well. He will be reunited with his family soon. After 2 weeks in care, he had fully recovered and was released back to where he came from. Alison and Gary found this little chick sitting on the ground at North Casino. It is an Owlet-nightjar, close relative to the Tawny Fromouth. Like Frogmouth's, they are nocturnal, but while Frogmouth's build shallow stick nests, the Owlet-nightjars nest in a leaf lined tree hollow. Despite being so young and still fluffy, it could fly perfectly well so was returned at night and placed up in suitable tree near where found. 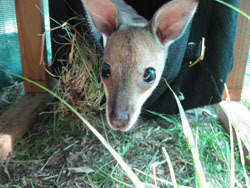 This little Red-Necked wallaby joey came in to care after Rubin called WIRES on 14 November after a car accident where joey's mum was killed. 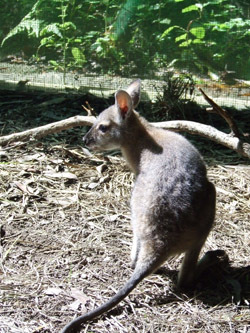 He has settled well in the care of WIRES macropod carer Jane, and is now spending his time in an outside enclosure exploring the world from his pouch. He has been adventurous a few times, hopping out of his pouch he is learning how to control those long legs which can take a bit of time. Sugar Gliders are communal and nocturnal so when a member of the public saw this little one sitting close to the ground in broad daylight he realised some thing was not right, he called WIRES and the little female glider was taken in to care. She is currently receiving treatment for a facial injury and when she feels better she will join a number of other juvenile gliders currently in care. All will be released together as a little family group in about 4 weeks time. Tawny frogmouth chicks unfortunately come in to care almost daily at the moment, many fall from up high in the trees where the nest is located, specially after high winds which we have had quite a bit of lately. 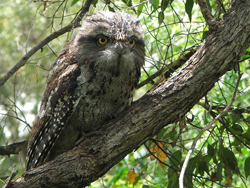 The Tawny frogmouth builds a nest that is not entirely secure in bad weather, if you have a tawny pair close by please check after storms that no little chicks are in trouble on the ground. Huge effort is put in to trying to reunite these chicks with their parents, but in some cases it proves too difficult and the chicks are taken in to care. At times WIRES is able to reunite the chicks with the parents some time later when the chick is able to perch, the parents readily accept them back, happy to have their offspring back where they belong. 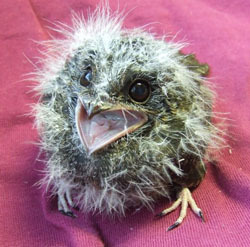 If you find a Tawny frogmouth chick please call WIRES straight away for help. This little Tawny is currently in care with a large number of others, some may be able to go back home soon, others will stay in care till ready for release when they can fly. Back in early October WIRES received a call from Casino vet clinic that a little joey had been brought in to the clinic, the person said they had cared for it for a few days but was now unable to. This is not unusual, often when some one finds an orphaned animal the first instinct is to care for it unfortunately without proper training this can often go terribly wrong in a very short time. The little joey was not well, she was undernourished and extremely stressed. She was brought in to care and after some time she started to relax at feeding time even though touching her was almost impossible without causing her further stress. Put simply she was terrified of people. Now 5 weeks after she first came in to care her condition is as it should be and she spends quite a lot of time out of her substitute pouch interacting with other joey's in care. She still has no time for people, but she does love her formula, with bottle in hand we become friends for a very short time. Please contact WIRES immediately after finding any injured or orphaned animal, do not be tempted to hang on to it even for a short time. If you wish to care for native animals join WIRES, let us train you in order for you to do the very best for our native animals. 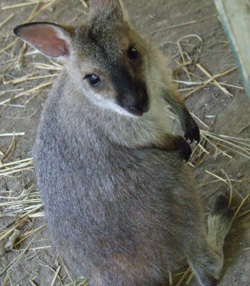 She is a Red-Necked wallaby and seen here 5 weeks after arrival. 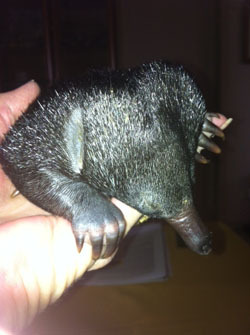 This little 290g Echidna Puggle came into care after being accidentally dug up by an excavator at Federal. Fortunately he was found the following day by land owner Rob. The Puggle's feet were sore & swollen after being exposed to the hot morning sun so a little TLC and soothing water saw his swelling gone by the following morning but his temperature was still too high. 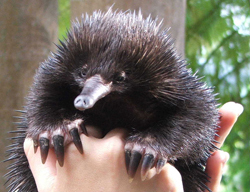 After 12 hours he was stabilized and special housing was set up to replicate the temperature of an Echidna burrow. 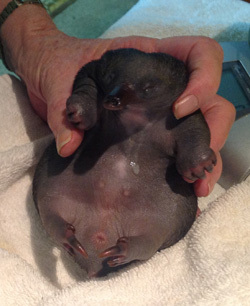 Feeding a puggle of this size is always a difficult task and re hydration is important. This little one has now started lapping his specialized milk formula and is in care with another puggle of similar age. Immediate initial care is so important when these little ones come into care as they must be kept cool. Transporting puggles must be undertaken during the early morning or evening when spring & summer temperatures have dropped as exposure to prolonged temperatures over 33deg C can be fatal. Our little Echidna puggle from Federal is growing steadily, his/her weight is now 347 gram, spines are coming through and eyes are finally open. 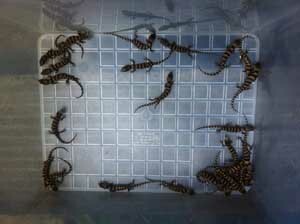 In this image you can clearly see the tail, something you will have trouble seeing once the spines are fully developed. Echidna's also have fur, in our region this is not often visible as they have little need for long fur, but further south where it is colder the fur can be longer than the spines and clearly visible. Puggle now named Feddie by his/her carer is doing well, putting on good weight and colour is changing to much darker as his spines grow. Feddie is now a mighty 623 gram spines are growing and life is good. 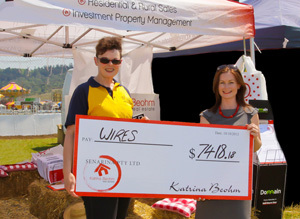 Katrina Beohm presents a cheque for $7418.18 to WIRES Committee member Kimbah Pengelly at the North Coast National. Each year, Katrina Beohm Real Estate donates the settlement from a sale to the charity of a vendor's choice. Willing vendors go into a draw at the Show and this year WIRES, nominated by Rob and Heidi Robertson, was pulled from the drum. 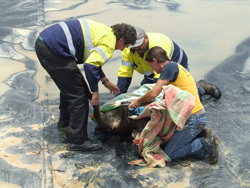 The NSW Wildlife Information, Rescue and Education Service aims to actively rehabilitate and preserve Australian wildlife and inspire others to do the same. 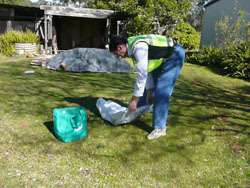 The all-volunteer, non-profit organisation needs new members all over the Northern Rivers. Call the 24-hour hotline at 6628 1898 to see how you can help. This Eastern Brown snake was rescued from discarded netting with little to no injury thanks to the vigilance of the property owner. WIRES were called as soon as the snake was seen to be trapped and WIRES snake handler Michael managed to cut it free before any damage was done. Please ensure old netting is disposed of in a safe manner, horrible injury is caused if the animal is trapped for extended time. 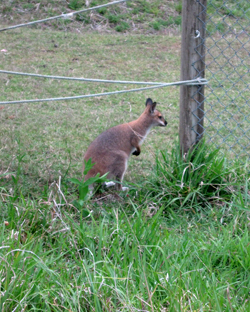 Image is of a Red-Necked wallaby taking her first tentative hops in to the wild. She has been in care since early March when she was orphaned at Kyogle due to mum being fatally wounded in a car accident. She took it slowly, went through the gate and back toward the house, she inspected the yard and was very calm about it all. She will have plenty of time to adjust, she can come and go from her large enclosure at will, her enclosure mates were all released some time ago, she was a bit smaller so had to wait a bit longer. They have all joined the wild population on the outside and all will help her along the way as she joins them and ventures further afield. 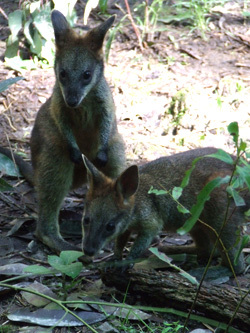 Wild dogs were responsible for the fates of this little Red-Neck wallaby and his mum. Mum was chased in to a dam near Drake where she drowned. 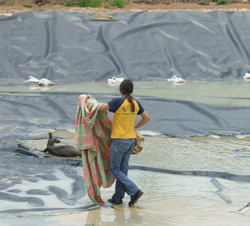 Her joey was dropped just before she entered the water and consequently saved by a farmer. 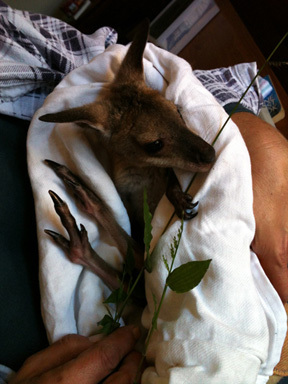 Joey is now in care with WIRES macropod carer Kate where he is slowly settling down and recovering from shock. Within a few more days he will meet other orphaned joey's in care and all will be released together when they are all old enough to go back to the wild. Wild dogs are all escaped or dumped pets. There were no wild dogs in Australia before white man arrived. Wild dogs are often thought of as Dingo's, but very few are in fact Dingoes, most are dogs that have survived after being dumped or run away from home. In the bush they have bred and are now is large numbers and unfortunately pose a huge risk to our wildlife that have no defenses against these at times large packs of wild dogs. Please ensure your domestic pet is secure, do not add to the numbers already out there. I received a call yesterday morning (7:30am). A member of public had what he thought was a Kookaburra chick, which he dropped around to my place on his way to work. 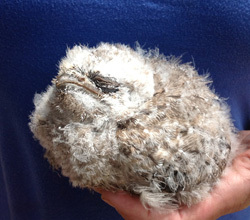 It was actually a Tawny Frogmouth chick which looked about 2-3 weeks old. 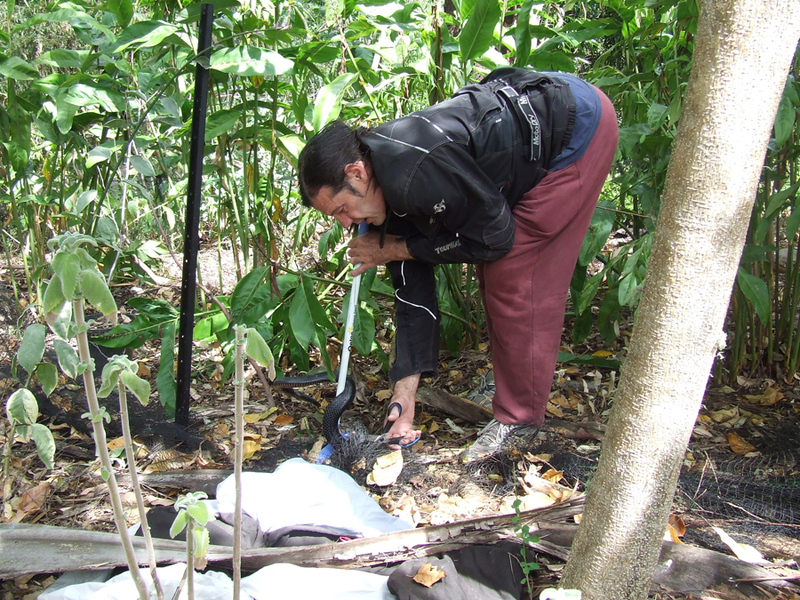 He gave me instructions as to where he found it (in reserve behind his home on Ocean View Drive, Alstonville). After talking to Jane ( WIRES experienced bird carer ), it was decided to try and reunite the chick with it's parents. 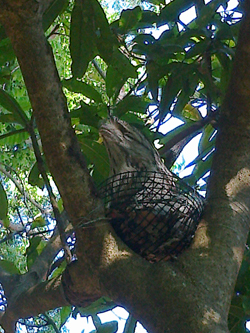 Jane said she would give me something suitable to use as a nest so I went to her home where she made up a bespoke Tawny Frogmouth nest from "high class" gutter guard (see photo below). I went to the location and tried to find one or both parents, but with no luck. I found what I believed was a suitable tree, very close to where the chick was found. It was a small mango tree, which was just inside the neighbour's yard. I spoke to the neighbour who was happy for me to put the nest in her tree. She also lent me her step ladder. I wired the nest in the tree and made up a very comfortable bed for the chick. Leaves, sticks, etc. King size no less. After making the chick gape and make some noise, I placed it in the nest and went back about 20 meters to observe. Alas, after 20 minutes, no sign of the parents. I had another quick look around and was able to find one of the parents, on a branch of a tall camphor laurel, which extended over the tree containing the 'Jane special' nest. I again spoke to Jane and we decided I should leave and come back later. I went back at around 2:30pm, and blow me down, if there isn't a second chick sitting on the ground where the first one was found. I picked it up and placed it in the nest with the original chick. Lucky the nest was a king sized one, eh! Again spoke to Jane who thought this was the best idea, but she was a bit worried about the weather. I was of the opinion that the tree would give the chicks reasonable shelter from both wind and rain. At 9:30 this morning I went around to check on things. Relieved to see a parent sitting on the nest with, I assume, the 2 chicks somewhere beneath it. I was unable, without risk of disturbing the parent, to get any closer to see if the chicks were OK. Looking at the picture, parent tawny seems very content, I am sure both chicks are tucked under safe and secure. WIRES hotline received a call from a lady in Lismore who had seen a python descending from the undercarriage of her friend's vehicle (which she had gone to move for her friend who was busy elsewhere) Snake and caller saw each other at the same time, both freaked and snake withdrew back up into the bowels of 4 wheel drive. 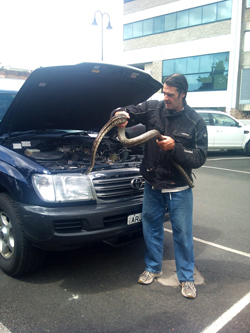 When WIRES snake handler Michael arrived, the owner of the vehicle (and her friend, who took the accompanying photo) were both there. The owner of the vehicle told Michael that she had seen a 2m python basking in the sun on her bonnet the afternoon before, and, having tried to "shoo it away" she eventually gave up and left the snake where it was there thinking it would disappear of its own accord. It seems the snake had a different idea as when Michael opened the bonnet he saw this 2m snake coiled on the air filter, where he had ridden in from Lindendale. The snake was safely returned home. 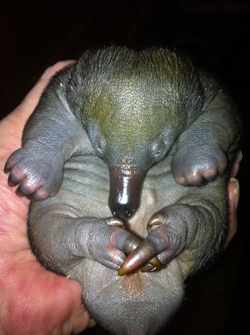 The images below are that of baby Echidnas called puggles. Few of us will ever see these animals at this early stage of development as they are carried in mums "pouch" and as soon as they start to develop spines, she will leave them in a burrow hidden in a safe spot. They will eventually emerge looking just like mum, only smaller. These little puggles are orphans, one due to mum being killed by a car, the other found alone by staff at Caroona nursing home at Goonellabah, mum most likely injured or dead, but was never found. Echidnas are fascinating creatures, long lived and hardly ever noticed, we tend to take wildlife such as Echidnas for granted as they are mainly active at night, unless we happen to come across them in our gardens where they do a great job of pest control whilst we sleep. The little one orphaned due to the car accident was indeed lucky. WIRES carer Leslee was on her way home from work when she came across an Echidna on the road, she stopped to move it of the busy road and realised the animal was dead, it had been run over by a car. Being aware that now is breeding time for Echidnas she started looking for a possible baby that may be close by, and she found the little puggle about 2 meters away. 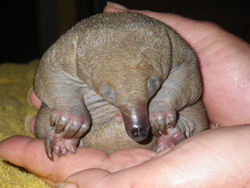 The Echidnas "pouch" is not a true pouch, it is a large muscle that envelops around the puggle and as such it is not all that deep and secure as you would find with our marsupials. 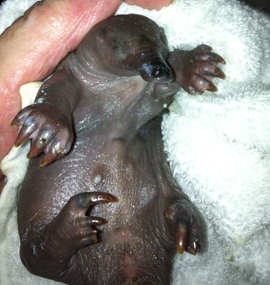 When mum is hit by a car, the little puggle will simply fall out and roll along the road. Both puggles are now in care with WIRES carer Leoni, they will be in care for many months and released back to the wild in time to come .Please stop if you hit an animal, look for possible joey's in pouches, or if an Echidna a little puggle close by. Staff at Caroona Nursing Home named "their" puggle Pugsley, thank you for calling us so promptly, Pugsley would not have survived alone for long. Billy, a young girl from Goonellabah called WIRES "to come rescue these poor brown snakes that have got stuck while doing the bizness; everyone else wants me to kill them but I feel sorry for them"
WIRES snake handler Michael went to the rescue and snipped them free, cutting wide of the snakes as he was on his own, bagged them, then took them to another WIRES snake handler, and with his help the two snakes were safely cut free of the netting. Spring is mating time for snakes, most unfortunate for these two that they came across discarded netting whilst mating, most fortunate that Billy reacted as fast as she did, neither snake sustained any injury and was released soon after being freed. 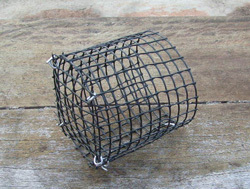 Please ensure netting and old wire is safely disposed of as it can be a deadly trap for many species of wildlife. 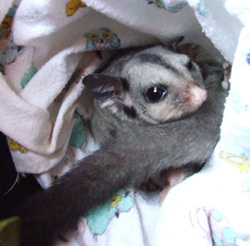 Sugar Gliders are beautiful little animals that live in our environment rarely seen as they are only active at night. They are great to have around as they eat the insects on our trees. Unfortunately most Sugar Gliders come in to care as a result of cat attacks, so please ensure your cat is safely secured from dusk till dawn so these little critters can live in peace. This little fellow came in to care with his brother after mum was killed by a cat. Both was very tiny, eyes not even open yet, unfortunately his brother did not survive, he had multiple claw marks on his body and died shortly after being rescued. However this little fellow is going strong, his eyes opened 3 weeks after coming in to care and it will not be too long now until he will meet other gliders in care and all will be released back to the wild as a little family group when they are old enough to fend for themselves. 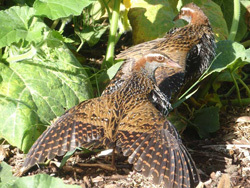 When a farmer at Drake noticed a dead rat laying close to the house he thought little of it. However when later that day the dead rat hopped up to him he was more than a bit surprised and also realised it was no rat. WIRES was called and Kim and Debra from Drake collected the little fellow which turned out to be a juvenile Rufus Bettong which is a vulnerable species in the Macropod family, vulnerable due to loss of habitat. He will be in care for some time until he is old enough to be returned back to his area where hopefully he can help to ensure more little Rufus Bettong's will continue to enrich our environment for many years to come. Note the prehensile tail used to collect nesting material. 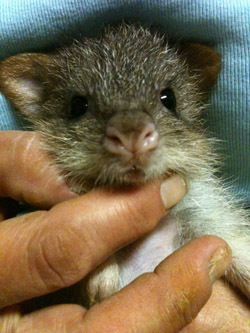 Our little Rufus Bettong is fairing well in care with WIRES Macropod carer Kathy. Image shows him in the process of building a nest, not quite finished you can see him hiding in the middle. 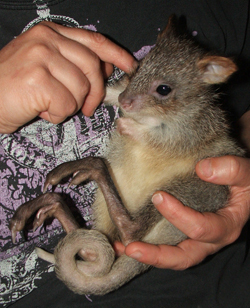 Bettong's are very different than our "normal "Macropod species. Bettong's build nests and even though this little fellow is only a juvenile, he started building nests within a few days of being in care. 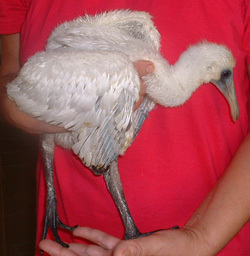 As he needed to settle down to being in care before he could be put in to the larger outside enclosure it was assumed he would be happy in a substitute pouch until he was moved outside.That proved not to be how he saw the situation, within two days of coming in he started on the first nest and within a few days he had built three, allowing him to change nest when ever he felt the need and Kathy was growled at each time she came close in order to feed him. He was moved out to the large outside enclosure after about 10 days as he was quite settled and his nests were moved with him. Other joey's in care are slowly learning not to come too close to his nests as they will be told of in no uncertain terms by loud growls coming from within. 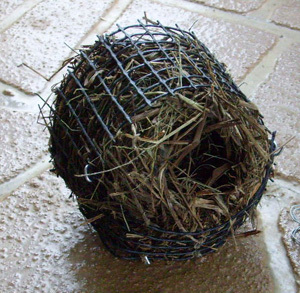 Discarded netting can be a deadly trap for wildlife if not used or disposed of correctly. 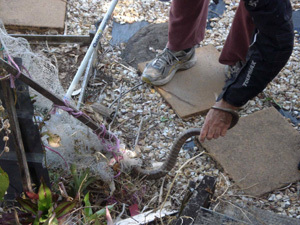 This Red-Bellied black snake was found trapped in fruit netting, even though the netting was only temporary it became a deadly trap for this snake. WIRES snake handler Michael was able to free the snake and fortunately it was not severely injured as the property owners acted quickly when finding the snake. In some cases the trapped animal may not be found for days in which case it is often too late to save them. The suffering can only be imagined. Please use wildlife friendly fencing, erect according to instructions and check regularly that no animal is trapped. WIRES would like to sincerely thank Byron Farmers' Market for their donation of $1500. This money will go toward building a wallaby enclosure in Suffolk Park, where local orphaned wallabies will be cared for until they are able to fend for them selves and released back to the wild. This Coastal Carpet Python was found in a church in Dunoon; he had been following a tradesman around for a couple of days, taking up a basking position right beside the fellow, moving when he moved. 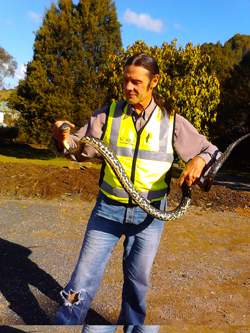 The tradie, a softly spoken Irishman, took a liking to "a wild creature that seemed to be so relaxed in the presence of a human", till he took a closer look, then noticed a truly terrible wound, kindly bagged the snake, then called WIRES. I responded and the snake was taken in to care. I took the snake to WIRES experienced snake carers where after close examination we discovered the injuries went right into the body cavity, necrotic and full of maggots. The wound brought cries of shocked horror, and drew expressions of sadness and frustration from both Kimba, Michael and myself, as we reluctantly had this placid, curious but horrendously maimed creature euthanased. The series of images show an example of the privilege and sadness our snake handlers become involved in, up close, increasingly. 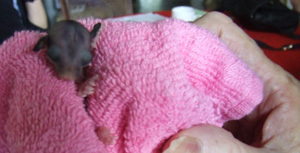 When WIRES carer Jo was called out to rescue two possum joey's found in mums pouch she assumed she was going out for Ringtail possums as that species will almost always have more than one joey. She was very surprised to find that it was two little Mountain Brushtail possums. Mountain Brushtail possums will only have one joey at a time, it is extremely rare for them to have two as in this case. Both joey's are male weighing 187 grams and 174 grams, they will be raised together as nature intended. Always remember to check the pouch of any marsupial found dead, if a female she will usually have a joey in the pouch in some cases as this one there may be more than one. If left they will slowly die. Saving the life of our precious wildlife is a responsibility we all need to take seriously, we are in most cases the reason they are diminishing all over our country. 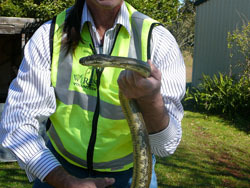 This yellow-faced whip snake was camped and getting ready to face a bitterly cold night, perched on a ledge above a body of water (pool-side in a mop's backyard) on high ground 15kms outside Lismore. Not the best spot thought the person living in the house, also being a bitterly cold night would the snake survive with no where to take cover. WIRES was called and the beautiful little snake was released in the sunshine next day, 500m from rescue site, to live another day in his chosen habitat. 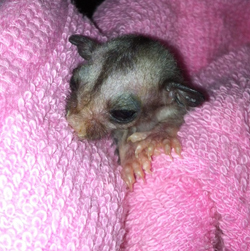 Last week I rescued a young female sugar glider with 2 babies in her pouch. 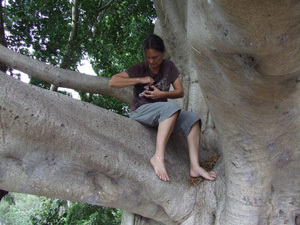 She had been nesting in the hollowed branch of a Camphor tree almost at ground level. 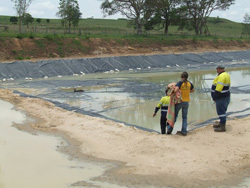 This shows how significantly a gliders habitat has been reduced. Normally a glider would nest in a hollow high up in a tree. A lady was walking her dog on a leash at dusk when it suddenly sprang at the hollow branch which then snapped off and fell to the ground expelling the glider and her two babies. Instantly the dog pounced and grabbed the glider and flicked it. The woman pulled the dog away and tied it to a tree then ran back to the glider lying on the ground, with one baby still clinging on. She picked the glider up and went back to the now ruined hollow and found the other little one and put it with mum. She then ran back home with her bundle of gliders and rang Wires. When I got to her house she had wrapped them in a jumper and put them in a box. I examined the female glider then and there as the woman wanted to know if it was alright. The glider’s back had been broken by the flicking action of the dog and she was paralysed. I brought the little family home and made her as comfortable as possible giving her plenty of native flowers to feed on during the night and some meal worms, water etc. The babies were sucking away in mums pouch. The following morning I took her to our wildlife friendly vet in Billinudgel and he kindly x-rayed the glider to see the extent of the damage. Sometimes an animal can have what they call spinal shock which they can recover from. Unfortunately as we suspected her back was broken so she had to be euthanased. Her babies will be in care for some time and hopefully when the time comes to release them they will be able to find a hollow high up in a tree where they should be. Dead trees are also a haven for wildlife. So if you have an old dead tree on your property it is best left standing, as it is an apartment block for all the glider species as well as birds and possums. 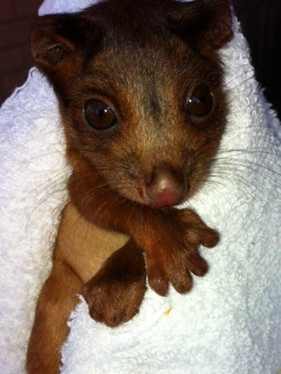 As rich and rewarding as caring for, rehabilitating and releasing our native wildlife is, some days can be sad ones. I recently received a young adult Sugar Glider that had been killed by a cat but she had 2 tiny 9gram babies in her pouch. Unfortunately one baby’s tiny body had been pierced by the cat’s claws leaving puncture wounds down one side of its body. I instantly knew that it was doomed but I took it to our wildlife friendly vet at Billinudgel just to see if it was possible to give it antibiotics, which is the only thing that can save a native animal from the bacteria on cat’s claws and teeth. He advised that the little one was simply too small. So I took it home and bathed its wounds in an antibacterial solution and hoped. It died 12 hours later. So sad and so easily avoidable if only people would keep their cats inside at night. On a brighter note the other little glider is doing well. Melissa of Rosebank was sitting on her verandah late in the afternoon when she heard a faint cry coming from close by. 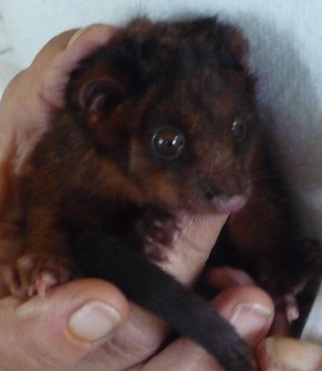 She investigated and found this tiny Mountain Brushtail possum joey on the ground under some trees. She picked up the little possum and called WIRES. The possum joey was taken in to care and later just before dusk the joey was taken back to Melissa's place in the hope that mum possum may be around. Unfortunately we were unable to locate mum. We will try again this evening to reunite mum and joey. Second night we were able to locate mum, and as soon as she heard her joey cry out for her she came through the trees to retrieve her baby. The joey was put on a branch as high as we could reach, and he hung on as mum came towards him, he dropped to the ground which was covered in mulch so he had a soft landing, and mum came all the way down to him. She waited a few minutes as he made his way in to the pouch and then she went back up in the trees with her joey once again safely in her pouch. Tree fellers for Essential energy were clearing branches from trees too close to power lines, as always conscious of any native animals that may be sheltering in the trees. One of the fellows working on the site could hear chirping, however he could not locate a nest in the bushes or in any of the trees. It took him a while to locate the sound, but he persevered and found two little chicks chirping in distress. The nest was well concealed amongst lantana and mulch on the ground, not in the trees or bushes as one would expect. WIRES was called and this little chick is one of two now in care. At first the nest was relocated close by but away from the heavy boots of the tree fellers, in the hope that the parent birds were still around, but after a few hours it became apparent that most likely they had left the area due to the disturbance and noise. It is hoped that the parents will return once the area is again quiet and undisturbed. WIRES will keep the chicks in care and try to reunite them with their parents as they start to fledge. 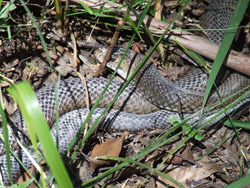 Do not assume snakes are sleeping during winter in the Northern Rivers area. A sunny day will bring them out as seen in these images. This Eastern Brown snake was spotted enjoying the sun, recharging the batteries. Best option is to leave the snake alone, it will move on, disturbing it may result in a defensive behavior which is no good for you or the snake. Snakes are all around us at any given time, much better for a snake such as this having lived in the same area all of its life to be left alone, it knows where it is, it knows how to get away in a hurry to a spot where it feels safe. If this snake was relocated another would soon move in to the open territory left, and the new comer is much more defensive as it is not familiar with movements of human neighbors or pets. We can live in harmony, all it takes is understanding and respect of our native friends. WIRES was called and the joey is now in care with Deb and Kim. She will grow up with other joey's and eventually she will be released close to where she was orphaned in about 8 months time. Please remember to keep a close eye on your domestic pets when in the country, our wildlife is having a hard time out there. Thank you Wayne for calling WIRES. Winter is here and most snakes are having a rest, but on a sunny day snakes may still come out and take advantage of the warmth. 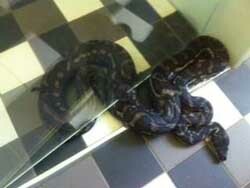 This Coastal carpet python did just that unfortunately it chose a skylight on a macadamia farm in Lindendale. WIRES snake handler Michael gently relocated it to a more convenient spot. 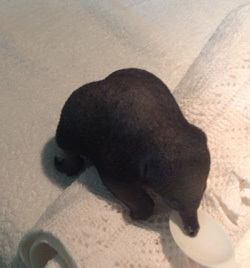 The cutest, tiniest little animal has recently come into my care. It is called a Feathertail Glider, so named because it has a flat tail that resembles a feather. 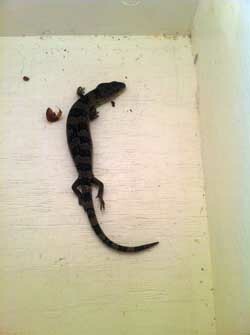 He was found on his own in an electrical box by an electrician doing a job for Matt from Wilson's Creek. Matt called Wires to the rescue. This tiny Feathertail has weighed in at 0.004gr. He has somehow lost his mum and family and is too young to take care of himself, so will be in care until he is old enough to be released. A couple of years ago I had another one of these delightful little animals in care that also weighed 0.004gr. I called him Speck and he was successfully reared and released. I have called this little guy Spot. Currently he is doing well and I hope to have the same success with him. Feathertail's are very family orientated so it can be difficult to raise one on its own especially as they are used to all snuggling up together. He is on 5 feeds a day of app 1ml of, specially designed, milk over 24 hours. 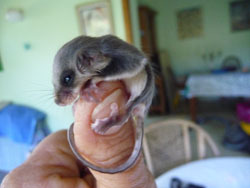 Feathertail gliders are distributed throughout Eastern Australia from South Australia up to far north Queensland and inland to the Great Dividing Range. It habituates tall open forests and woodlands. 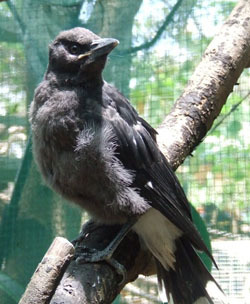 Its adult weight ranges between 10 to 15 grams. 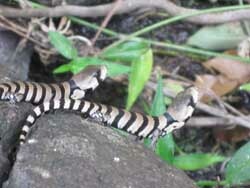 Its body length averages between 65 -80mm and the tail is between 70and 80mm. It has a patagium or membrane from knee to elbow which enables this tiny creature to glide for an amazing 20 meters on a single glide and its foot pads have ridges of skin perforated by many sweat glands that create surface tension so it’s feet act like mini suction caps, enabling it to move on any surface including vertical panes of glass. Watch out Spider Man this little guy can go places. Feathertail's live in large family groups of about 30, in nests constructed in palm trees, tree ferns, old bird’s nests, crows nest ferns. Using eucalyptus, Acacia and Casurina leaves and strips of bark and lined with feathers and mammal fur they build a spherical closed nest 6-8cm in diameter. They will also build in telephone junction boxes and other man made structures. Their diet consists of nectar, pollen, honeydew and invertebrates which it collects with its long brush like tongue. 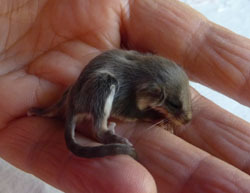 They communicate softly with little clicking sounds and it is thought that like the Squirrel Glider it makes ultrasonic sounds. Feathertail's are nocturnal, sleeping all day and roaming around at night to feed which is another really good reason to keep cats inside at night. Also it is good to remember that if you have containers of water outside, to put a stick in them so that if a glider or any other small creature falls in they can climb out. WIRES receive many wallaby joey's in to care, reason for joey's being orphaned are varied, most are from car accidents where mum is fatally injured, others are from dog attacks where the joey may be dropped in the haste of mum trying to get away, or she may be fatally injured . This little Red-Necked wallaby came in to care for different reason. 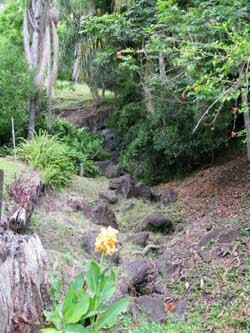 On 9 July Sam from Nimbin heard gun shots in the distance, but was unable to say exactly where it came from. That same evening a wallaby was seen obviously injured sheltering near buildings, but when approached it hopped away, Sam was unable to get close enough to investigate further. 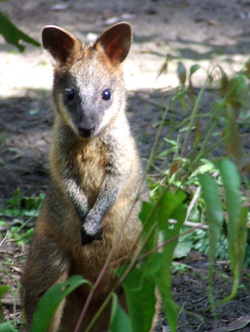 The following morning the wallaby was found dead near some cabins. 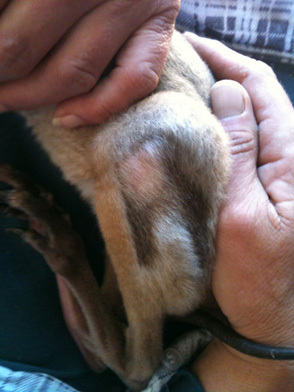 Sam investigated further and a gunshot wound was found on the leg of the wallaby, she had slowly bled to death. In her pouch Sam found this little joey. The joey is now in care with WIRES carer Guy, it is approximately 7 months old, and certainly unable to fend for itself it will be in care for approximateley7 months when it will be returned back to the wild. How irresponsible of whomever did the shooting, to injure an animal and then leave it to suffer, in this case also the joey, had mum not been found by Sam, her joey would also have died a slow agonizing death. Wildlife is protected by law. 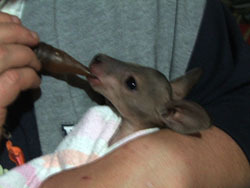 Thank you Sam for saving the life of this little joey. 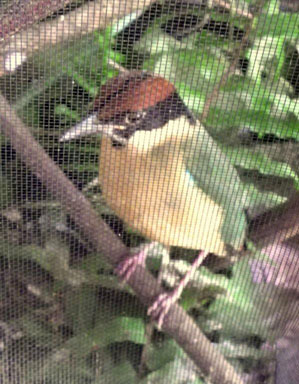 The shy and beautiful Noisy Pitta is rarely seen. They forage in leaf litter of the forest floor, favoring snails. They are locally migratory, and move down from mountain forests to coastal lowlands in winter. This Noisy Pita was rescued at Goonellabah after colliding with a window. It suffered bruising and a suspected ruptured air sac and Goonellabah Vet Matt cared for it for the first couple of days. It was then transferred to WIRES carer Melanie. After another week in care it was released a few blocks from where it was found in a bushy gully. 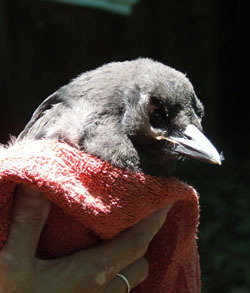 This Noisy Pita was rescued by Louise at Ocean Shores after it was found being attacked by Noisy Miners. She successfully released it after a few days in care in a bushy area. Ringtail Possums are shy, gentle little creatures who live in families of nine or so. They build nests like structures in the canopies of trees which they all share together. They build the nests themselves out of twigs and leaves which they transport to the building site with their tails. They also use their tails like a third arm to hang onto branches, and when at rest they curl their tails up so it looks like a ring, hence their name. These delightful little animals live in trees and rarely ever come to the ground, so if you see one on the ground there is something wrong. Once a ringtail has come/fallen to ground especially in the early morning or daytime it will stay where it landed and curl up in a tight little ball hoping that no predator will see it. Most Ringtail Possums come to us due to cat and dog attacks. The dogs find them on the ground where they have ‘frozen’. Ringtail Possums have a similar gut to a Koala. 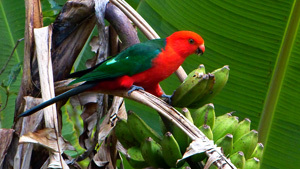 Their diet consists of mostly new leaf shoots of gum trees, lily pilly and other natives. They do not eat fruit. They are nocturnal animals, sleeping all day until after dark. Their life span is about 5 years. 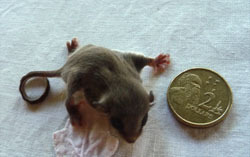 This sweet little possum was found on the ground by Phillip Skinner of Eureka who promptly rang WIRES. WIRES member Bobby Green picked her up from Phillip and brought her to me. She was a bit dehydrated indicating that she had lost her mum sometime during the night. She is what we call a back young, weighing in at 98gr, so would have been traveling on board mum’s back and occasionally getting off to feed. She could have lost her mum in any number of ways. Could have simply fallen off her back onto the ground or an owl or cat or snake could have attacked mum. We will never know but what we do know is that we can take good care of her and release her into the wild when she is old enough, which will be when she weighs about 400gr. Her adult weight will be between 660 grams and 900grams. She is unusually dark in colour. Almost all ringtail possums in this area are a russet brown colour, and most have a white tip on the end of their finely furred tail, but this little girl does not have the white tip and is a dark chocolate brown. Ringtail Possums are shy, gentle little creatures who live in families of nine or so. They build nest like structures in the canopies of trees which they all share together. They build the nests themselves out of twigs and leaves which they transport to the building site with their tails. This little possum is currently being kept in a closed pouch until she gets used to me and her feeding times, a couple of days usually till she relaxes and realises that I am not going to eat her. She is being fed 4 times daily. As soon as she feels comfortable I will make up a dray for her and attach it to branches inside a small cage full of native foliage, then at night she can have a little time out exploring. As she grows she will spend more and more time out of her dray at night. When she is ready I will then transfer her to a larger indoor/outdoor cage and sometime after that she will go into an outside aviary and from there to a release aviary which she will spend a couple of weeks in before being released. This all means that she will be in care for approximately 3 months. Thank you Phillip for finding this little one and contacting us so promptly, enabling us to ensure her well being. Please remember to contact your closest wildlife agency when finding an injured or orphaned animal. 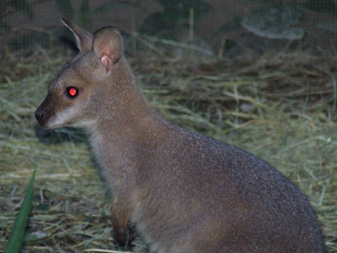 This little Red-Necked Wallaby was found in his dead mothers pouch late one evening. The person that found him carefully wrapped him in a warm artificial pouch and knew he needed heat as he was only just furring. She put him near the fireplace to keep warm overnight and called WIRES the following morning. Unfortunately being near a fire place is cosy for us, being able to move away when the heat gets a bit too much, a small joey does not have this ability and will quickly over heat. 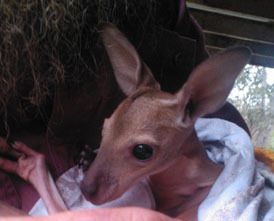 When the carer collected this little joey he had second degree burns on his hip and leg after being too close to the fire. He was very dehydrated and in desperate need of intensive care. It was touch and go for 4 days, but being a little Aussie battler he pulled through with loving care given by WIRES macropod carer Kathy. Now 6 weeks after coming in to care his fur is growing well, but as you can see in the picture where his burns were the fur is a different colour, this will stay like that for quite some time, possibly forever as damage was done to his skin. 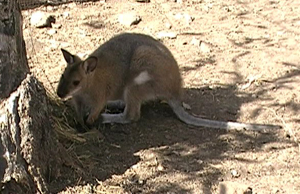 He also has some muscle damage, and for now he struggles to weight bear on that one leg, but as he gets stronger he will regain muscle strength and before too long he will hop as any other little wallaby, fast and sure footed. Please remember to call as soon as possible if you find an injured animal, we will talk you through the best way to initially pouch the orphan. Joey seen here 6 months after first coming in to care. He has done extremely well in care and will be returned to the wild in the not too distant future. His burns have healed but you can still se the discoloration on his fur, the white mark will most likely forever leave no question as to who he is. 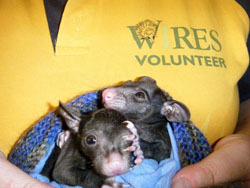 WIRES phone roster received a call this morning that a possum joey had been brought to National Parks after being found on the road clinging to her dead mothers body. 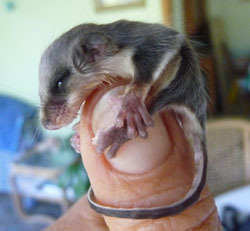 When WIRES carer Leoni saw it was a little Ringtail she contacted the lady that had found the joey to get directions to where the mothers body was, as Ringtails always have more than one young. 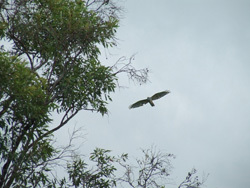 Leoni drove to the spot near Tregeagle and as she got out of the car she could see a large bird on mums body. It flew of as Leoni approached and there was no longer a Ringtail sibling, only two very engorged teats. Please remember to check the pouch for one or more young, even if one is on the back more may be in to pouch. WIRES hotline received a call from a driver on his way from Woodburn to Lismore. He had stopped to assist when he saw an approaching vehicle pull over very suddenly. Driving the other vehicle was a young Norco employee in a company car who had noticed unexpected movement on the passenger window ledge. 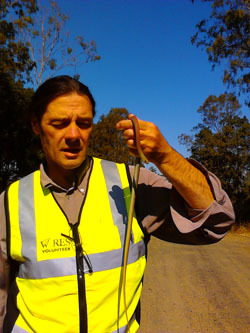 A red-bellied black snake was inside the car, less than a meter from her. Other Norco employees who had been following in another car were soon on the scene. By the time WIRES arrived, the Norco employees had opened all five doors, removed the contents and made a thorough search. 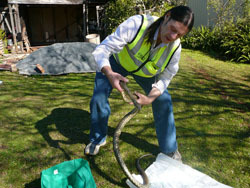 Rescuers investigated further but the snake was not found. No one had seen the snake leave. The driver was adamant that the snake was still inside and she was not willing to resume driving the vehicle. It was towed to a Holden dealership in Lismore. The following morning, WIRES volunteers arrived at the dealership to search again because mechanics were understandably reluctant to chance an encounter with a venomous snake. Again, a thorough search yielded no result. Apart from completely dismantling the vehicle, there was little else to be done to ensure the snake was no longer inside. The car was transferred to the Norco depot. Nine days after the initial sighting, the WIRES hotline received another call from Norco. Employees had spotted the snake sunning itself on the passenger seat. 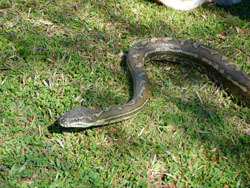 Rescuers were soon on the scene but were unable to find the snake. So many days after the snake had been first seen, it was overdue for a drink and a feed. WIRES suggested leaving doors open and putting a band of fine sand around the vehicle to show if the snake had made an exit. The following day, there was a call from Norco advising that the snake was on the dashboard. Fortunately a WIRES snake handler was less than a kilometer away at the time and was at their depot within a few minutes. 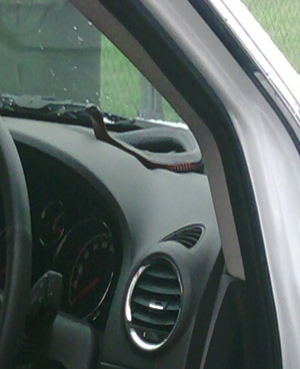 The elusive snake was still there on the dashboard. 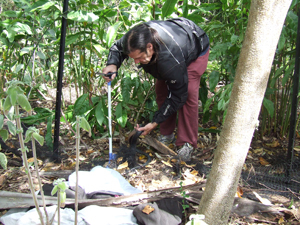 The snake was larger than expected, estimated at more than 1.5 metes! 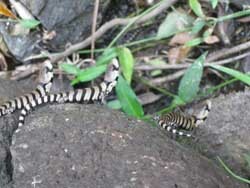 When approached, the snake flattened itself, which is typical of these shy creatures when they feel threatened. The rescuer used special tongs to grab and then bag the snake. 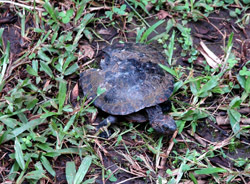 Very soon afterward it was released on the banks of the Wilson River. Norco made a special donation to WIRES for their efforts. This red bellied black snake is in care with reptile handler Michael . It was attacked by a dog, causing extensive injuries to its body. As part of its treatment, it requires regular dosing with an antibiotic to treat the infection caused by the attack. Snakes take a long time to heal, requiring continual handling. 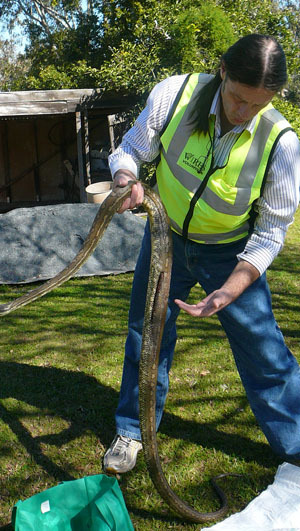 This poses issues for snakes and their handlers, and without strategies such as this tubing technique, care for this animal would be impossible. It is true that Australia is home to 18 of the top 20 deadly snakes in the world. Despite this, we have one of the lowest instances of snake bite and death resulting from snake bite. 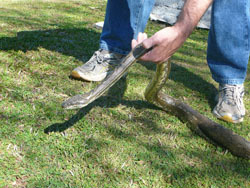 Most people who do get bitten are trying to kill or capture the snake at the time. Despite these facts, some people will still try to kill a snake once they have seen it. 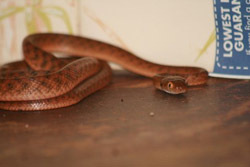 People fear that the snake poses a threat to their pets, kids and themselves. There is little evidence to support this fear, however. Overwhelming academic evidence indicates that snakes are shy and avoid contact with society at large. A turtles top shell, known as a “carapace” is made of bone and the turtles whole skeletal structure is fused to it – his spine, ribs, shoulders and pelvis. This poor saw shelled turtle came into care after having an encounter with a dog in ...Lismore. The dogs teeth punched holes straight through the carapace. While he is no doubt traumatised, physically strained and compromised, he is an amazing story of survival. About a quarter of his entire carapace is missing in what seems to be an old injury sustained in the wild. 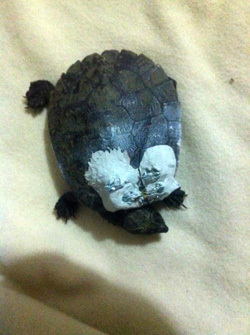 This turtle is one of the most amazing statements of survival I have seen in a wild animal. From my experience, an injury of this nature would have taken a year to heal at least in captivity. I can only assume it would have taken much longer in the wild. With the placement of the missing carapace, a good deal of ribs and at least half of his pelvis is missing. Yet somehow, despite all of this, he is alive, and in amazing condition considering his (assumed) history. Walking in to your kitchen you would not expect to see a snake curled up on the kitchen shelf, this is however what Helen encountered. She immediately called WIRES and was advised to leave the windows open so it could vacate the kitchen overnight. Snakes may venture inside but will rarely stay there for long once disturbed, leaving them an avenue of escape will usually have the required result of the snake leaving as fast as possible once it feels safe to do so. 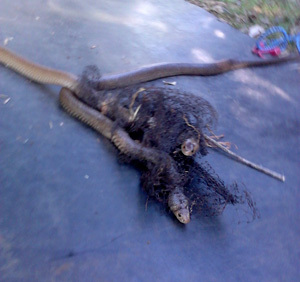 Helen sent us this image of the mildly venomous Brown tree snake before it left the house. Thank you Helen for calling WIRES and also for sending image. 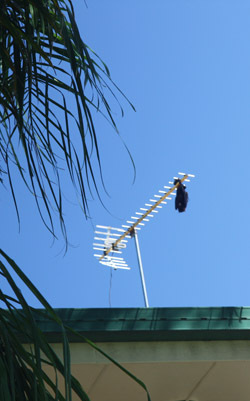 The Lawrence's of Lismore called the WIRES hotline when they noticed a flying-fox stuck on their neighbour’s antenna. It was a double storey house and the residents were at work. After contacting the resident and gaining permission to go onto the property, we needed to get someone with long ladders to access the roof and try to remove the animal. 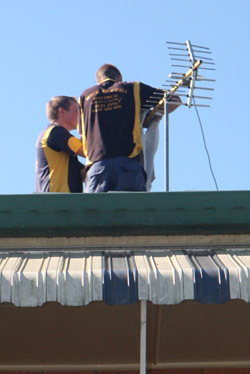 Calls to some local antenna specialists had a common result; they would be keen to help but they were all currently doing jobs in outlying areas. Finally Mick Sawtell Electrical of Lismore helped us out by sending two of their tradesmen, Todd and Jay with a long ladder. Using a few thick towels to protect themselves and wrap the struggling flying-fox, Todd and Jay were able to lift the impaled wing membrane off the antenna, freeing the flying-fox. They safely delivered he wrapped bat to the waiting WIRES bat carer. The rescue took no longer than ten minutes and ended the stress and suffering for the entangled bat. 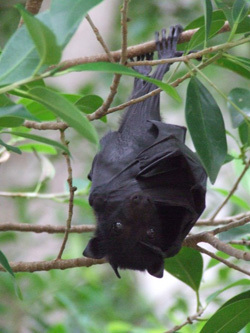 “Aerial”is a young female black flying-fox and has a large hole in her wing membrane. This should heal, but will take a couple of months. Hopefully Aerial will make a full recovery and be released. As nature’s crucial rainforest tree pollinators and seed disperses, the life of every flying-fox is valuable. Thanks to the Lawrence's for calling WIRES and a huge thank you to Mick Sawtell Electrical, particularly Todd and Jay. 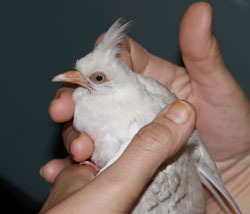 A juvenile albino crested pigeon came into care recently. 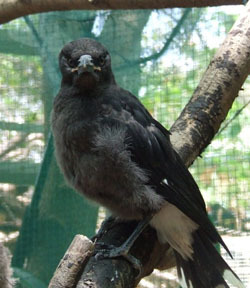 It has pink eyes, feet and beak and still has the characteristic bar pattern on its wing feathers. It is currently being raised with other juvenile pigeons. A WIRES carer was recently returning from releasing at kookaburra at Mongogarie Rd, Leeville, when she stopped to check a kangaroo that was on the side of the road. 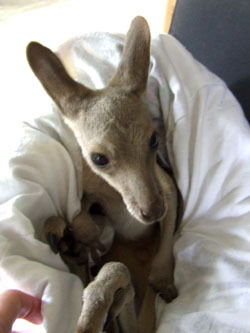 The Eastern Grey kangaroo was dead but she had a furred female joey in her pouch just like the one in this image. Although not injured and still warm, the joey had died because the full weight of her dead mum was on top of her for the whole day. If you do accidentally hit a ’roo, or any other animal, please stop. Check to see if it needs help or if it has a baby on board. Many Australian native animals killed on our roads have pouch young. This includes kangaroos, wallabies,bandicoots, possums and echidnas. 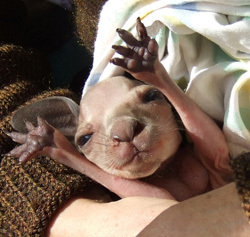 Often, these babies survive the initial accident and can live for up to four days in the pouch of their dead mother. Always remember your own personal safety when stopping on our roads. A reflective vest will make you more visible to other motorists. Be aware and care, and you may be able to save the life of one of our unique native animals. Buff-banded Rails nest on the ground so when land was being cleared by an excavator at Ballina in January a nest was disturbed, mum flew of and chicks just hatched were left behind. Quick action by land owner Michael calling WIRES for help resulted in the chicks coming in to care immediately and they are now finally ready for release back to the wild. Image here taken by Leslee Hawley at time of release 8 weeks after the chicks were orphaned. Spoonbills will return year after year to nest in the same location even the same tree. 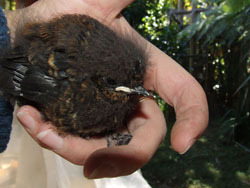 This little nestling was found after falling from the nest high up in the tree, so high it was impossible to return it which is how it ended up in care. When it was able to fly it was reunited with the parents and the flock at Teven after 5 weeks in care. 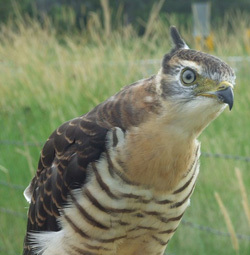 Pacific Baza's are Australia’s only crested hawk and are easily recognisable by their small crest and distinctive banded chest. 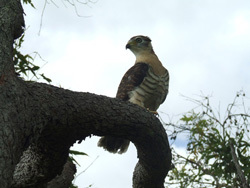 Pacific Baza's are excellent parents and both share the role of caring for and protecting their young. WIRES was called recently after a Pacific Baza fledgling was rescued from the middle of the road near North Casino and taken to the Casino Central Vet Clinic. 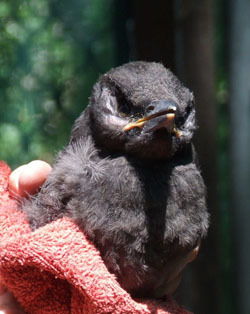 Luckily the young bird had not been injured and must have landed on the road during one of its first flights. After the rain cleared the next day, the young Baza was taken back to where it was found to see if it could be reunited with its family. Immediately, both parents arrived calling excitedly while the young bird returned their calls. It was placed in a suitable tree away from the road, while the parents watched on anxiously. Returning it to its family was the best possible outcome for all, and hopefully this Baza will remember to be more careful of roads. 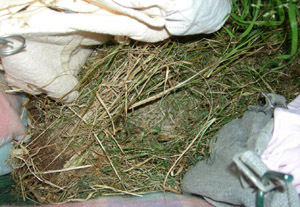 A Red-browed Firertail finch nest complete with 3 chicks fell from a thick leafy tree during a wild storm. WIRES was called and as the chicks were close to being able to fly I though it would be best to try to reunite them with their parents leaving the chicks in their nest. Problem being how to get the nest safely back in the tree. I placed the three chicks in a small basket and using some gutter guard cut to the same size as the nest I wrapped it around the nest, clipped it together and attached a small piece at the back, leaving the front open for the parents to enter. Using a ladder the nest was placed back in the tree at the same height as it had fallen from, it was tied on securely and the chicks were then placed back in the nest. As soon as the chicks started chirping the parents came back to tend to their offspring. 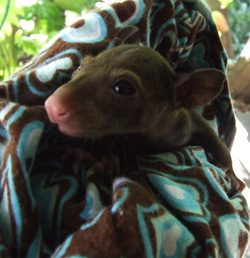 WIRES member Alison rescued this little Red-Neck wallaby joey after having watched her trying to get back in to mums pouch for some time. Mum was lying in the grass unable to respond to the joey's needs. When Alison approached mum did not move, this is of course not normal, mum should have instantly opened her pouch for the joey to get in and hopped away at speed. Alison was able to pick up the joey and realised it was very dehydrated and under nourished indicating that mum may have been ill for some time unable to produce the milk needed for her joey. Alison gave mum some water and kept an eye on her, and after a few hours she got up and slowly hopped away. One has to wonder if she came close to the house knowing her joey needed help. The joey is now in care and is doing well, after re hydration and much needed nourishment she is gaining weight, she has joined a group of joey's already in care. Alison hopes to see mum again hopefully healthy and recovered from what ever was wrong. Joey seen here 9 weeks after arriving in to care, she is now hopping out of her pouch to graze in the nursery pen interacting with 6 other joey's in care, all of varying stages of development. After 16 weeks in care joey is now well and truly on her way, she is choosing to spend most of her time out of pouch, she has made lots of friends with other joey's in care. Months ago I noticed that my resident bearded dragon had deposited some eggs in my garden mulch. I made a point of not disturbing that area. 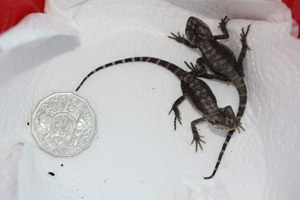 Today while gardening I was thrilled to discover some bearded dragon hatchlings. Most ran away but I managed to briefly capture two of these little ones to get this pic. I managed to weigh and measure one; 3 gr and 10cm nose to end of tail. I hope to see them regularly in future while gardening. Just before New Year WIRES received a call from Ray at Broken Head regarding a small Swamp wallaby joey having survived a car accident in which her mum had been killed. The sparsely furred joey was brought in to care and has since thrived. She is now fully furred and starting to leave her pouch to investigate her enclosure together with another Swamp wallaby joey that came in to care from Bess at Suffolk Park. The joey was found entangled on a barbed wire fence. Both joey's are doing well and enjoying each others company, they will stay in care for many months yet until they are old enough to fend for themselves in the wild. Five juvenile Northern Brown Bandicoots came into care after their mum was accidentally killed when run over by a lawn mover. They spent some time in intensive care and when big enough they were moved into a larger outdoor enclosure where they had lots of fun foraging amongst the leaf litter. Here they learnt to search for tiny insects. As their natural instincts cut in they began making their own tiny nests. It was now time for them to be released back into the wild. These little critters were a delight to care for and were quite responsive to their substitute carer. 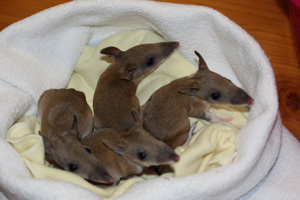 It was a pleasure to assist and watch these bandicoots grow so quickly in care. 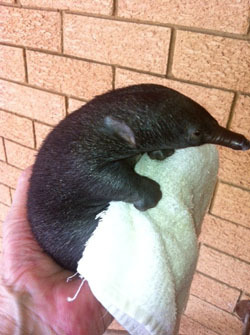 This little Echidna came into care after being washed out of his burrow from recent heavy rains. Digger as he has been named was found by the Woodburn Postie who took on an extra duty of care to deliver him to Lismore Vet Clinic for a check up. Digger then came into care in a very weakened condition, needing rest and a good feed. 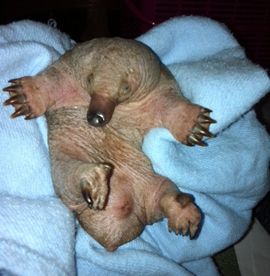 Still dependant on his mothers milk he has been hand fed with specialised Echidna milk formula. This is a slow process that takes about an hour per feed as Echidna puggles slurp their milk very slowly and often nod off to sleep. A temporary burrow was set up for him to sleep in. This large juvenile Tawny Frogmouth was found on the ground at Rosebank with an engorged tick on his face. Nathan & Di rang WIRES and the tick was carefully removed. Ticks this year have been particularly nasty and have been affecting birds and wildlife that are normally immune to them. The North Coast Livestock & Health Authority Vet, Phil Kemsley, believes ticks are climbing higher into the trees and shrubbery to avoid the wet conditions and this seems to be affecting more birds in particular. The Tawny was very "flat" when found and we were all very happy to see him pull through after being rehydrated. Five days in care and then he was released back into the huge Tallowwood tree where his mother was still waiting for him. Di & Nathan were elated at his return. Meagan came across this Saw Shelled Tortoise on 22 January after it had been hit by a car along Theresa Creek Road near Mummulgum. It was taken in to care by WIRES carer Helen and received treatment at Casino vet clinic. The tortoise will be in care for quite some time but as long as everything goes well it will be released back to the wild when healed. A concerned citizen in Goonellabah went to investigate a dead bandicoot he found on his property. When he lifted the body of the adult female, he discovered four healthy young huddling beneath their mother’s body. These four long-nosed bandicoots were taken into care by WIRES carer Sharon, and will soon be released into the wild. 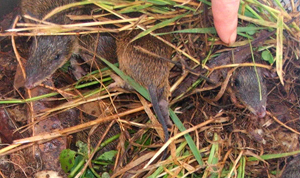 Long-nosed bandicoots are common in the Northern Rivers but don’t often come into WIRES care. They are nocturnal and forage for insects, larvae, worms and plant roots. They’re handy to have around when there is an infestation of lawn grubs. 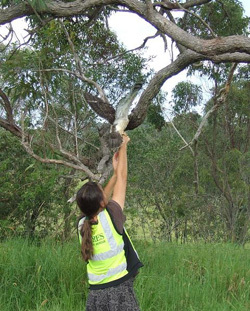 If you have bandicoots on your property it means you have a healthy environment. 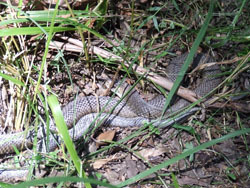 When Rebecca from Kyogle went out whipper snipping in December she did not suspect a Pink-Tongued Skink to be hiding in the grass. She called WIRES immediately after realising she had injured it with the whipper snipper. 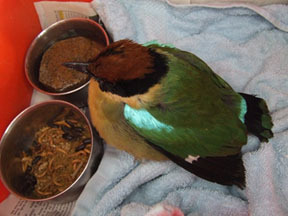 It was taken in to care as it had a head injury. WIRES reptile carer Kimbah soon realised that the skink was heavily pregnant, and a few days later she had not one skink in care, but 28. 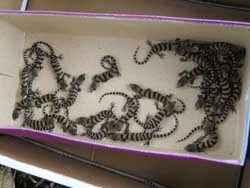 Mother skink had given birth to 27 healthy babies. All will be released back to Kyogle in the next few days. 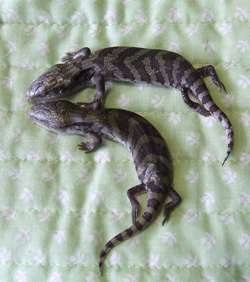 Thank you Rebecca for being observant and calling WIRES saving the life of not just one, but 28 skinks. This Coastal Carpet Python was most likely looking for a drink of water when it ventured in to a bathroom at Mc Leans Ridges. Unfortunately it tried to get under the shower screen door and got itself well and truly stuck. WIRES snake handler Helen helped it free and it is now in care to ensure it has no injury from being squashed under the door. It will be released as soon as we know for sure it is uninjured. 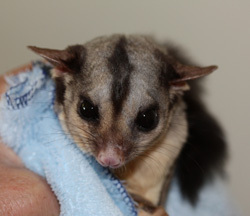 This little Sugar Glider had a rough start to the new year, being found on the road by Jess at Modanville. Gliders are rarely hit by cars so there had to be another reason why this little fellow was in trouble. It turned out he had two large paralyses ticks. Gliders are normally immune to ticks, but for some reason ticks are particular toxic this year and WIRES has received many animals in to care that would normally not have problems with ticks. So far most have recovered after the ticks have been removed, few days in care and most are released back to where they were found as was the case with this little fellow. Thank you Jess for calling WIRES. 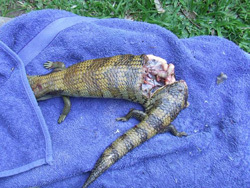 This large female Blue Tongue was severely injured in a dog attack when she was preparing to give birth. Blue Tongues give birth to live young, unlike many other lizards. 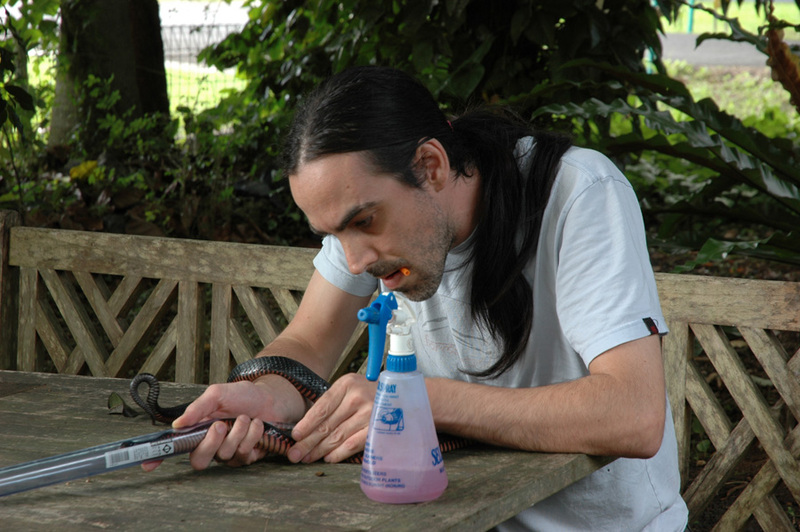 Home owner Simon immediately called WIRES, then quickly took the lizard to the nearest carer. 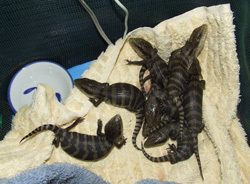 Even though the mother was mortally wounded, with help 12 baby Blue Tongues were delivered. Simon's quick actions made the difference to her babies, and nine survived and are doing well. Thank you Simon for your quick response.